Beautiful and mesmerizing. More like a caper film than a documentary. That’s how I’d describe Man on Wire, winner of the 2008 Oscar for Best Feature Documentary and the Sundance Film Festival Jury Prize for World Documentary. Director James Marsh set out to tell the story of Philippe Petit, the man who wire walked between the World Trade Center Towers in August, 1974. What he ended up with is closer to drama than newsreel. With the backdrop of Nixon’s Watergate and an America reaching for the stars with the groundbreaking of the WTC, Mr. Marsh effectively blends talking head documentary shots, actual footage, photos, interviews, documents, and recreations of the events to tell this remarkable story. Original music by J. Ralph with help from Michael Nyman’s signature piano helps build the emotion. The score is nicely combined with a diverse selection of songs. It’s clear that Mr. Marsh was given full access to the Petit’s personal archives. He chose his assets wisely and the result is engrossing. Footage, anecdotes and Mr. Petit himself on screen walking us through the story; paragraph by paragraph. Yes, there’s a bit of French hubris that hits us in the face, but that’s part of his charm. Mr. Petit is clearly a driven and talented man who approaches each day as if it’s a new canvas to paint. He occupies much of the screen time and puts on a show, retelling the event in exuberant detail. It’s not about “why,” he says when in custody. There is sufficient evidence to lead us to believe it’s about must. Nearly six years in preparation, this feat would have an improbable chance of success if it had full support of the entire city of New York. But to pull it off undercover with a makeshift band of players was nothing short of astounding. They had one stroke of good fortune after another. A guard on the 104th floor saw them walk past carrying the heavy coils of wire but said nothing. The arrow shot from a bow to connect the two buildings landed precariously on the corner of the other tower and could have fallen. Any single broken link along the way and it would have meant the dream would have failed, or worse. Once he was on the wire the police arrived quickly and summoned him to return to one of the towers. Petit would move close to them, and just as he was about to be in their grasp, he would turn and move toward the other tower. In all he spent 45 minutes on the wire and crossed eight times. All on no sleep, having had to rig the wire during the previous night. We know how it turns out, as it happened over 30 years ago. Still there is tension and uncertainty because what he did was so unbelievable, it leaves us questioning our own memory. Mr. Marsh and the filmmakers frequently make you feel as if you’re watching a feature film. Only when he cuts to the individuals telling their part of the story, or interspersed archival footage, are we pulled back into reality. France gifted the Statue of Liberty to us as to commemorate the perseverance of freedom and democracy in the United States and to honor the work of the late president Abraham Lincoln in hopes that France would be inspired to create their own democracy. The Twin Towers were meant as a symbol of worldwide commerce. A global statement and uniquely American. I always found it mystical that it was a Frenchman who was so deeply drawn to these Towers. A deep connection was formed between them. Something we all experienced on that bright September morning in 2001. All in full view of Lady Liberty. 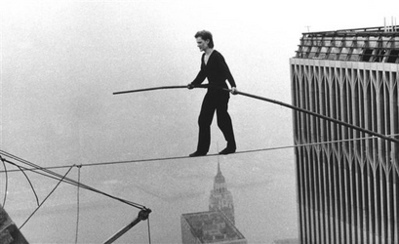 The film is based on Petit’s book, To Reach the Clouds: My High Wire Walk Between the Twin Towers. There is also a wonderful children’s book on the subject, The Man Who Walked Between the Towers by Mordicai Gerstein. It’s full of magical artwork that earned a him a Caldecott Award and captivated the interest of my four year old. Take a break from the Hollywood grist mill of crushingly generic films and go see Man on Wire. Highly recommended. Available on DVD, December 8, 2008. Visit the official Man on Wire web site here. Haunting theme to Man on Wire. Update: Man on Wire is available on Netflix. Read my review of The Walk here.